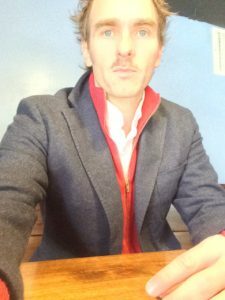 Brian Blanchfield is the author of three books of poetry and prose, most recently Proxies , published by Nightboat Books in 2016, and by Picador UK in 2017. A collection of essays —part cultural close reading, part dicey autobiography—Proxies was awarded a 2016 Whiting Award in Nonfiction , was named a finalist for the Lambda Literary Award in Gay Memoir and the PEN USA Literary Award in Nonfiction , and has been widely reviewed . His first two books are collections of poetry: Not Even Then (University of California Press, 2004) and A Several World , (Nightboat Books, 2014), which received the 2014 James Laughlin Award from the Academy of American Poets and was longlisted for the 2014 National Book Award for Poetry . His poetry and prose have appeared in Harper’s, The Nation, Chicago Review, BOMB, The Brooklyn Rail, Lana Turner, The Paris Review, Brick, Conjunctions, Guernica, StoryQuarterly, and The Oxford American, among other journals and magazines. Two long sequences—one poetry, one prose—are available as chapbooks: The History of Ideas, 1973-2012 (Spork Press, 2013) and Correction. (Essay Press, 2016). He is the recipient of a 2015-16 Howard Foundation Fellowship . Born in 1973 in Winston-Salem, and raised in the central Piedmont of North Carolina and Virginia, he has lived in New York City, Los Angeles, Missoula, Boston, Tucson, and Iowa City, where he has taught creative writing at The Pratt Institute, Otis College of Art and Design, Cal Arts, University of Montana, University of Arizona, and The Iowa Writers’ Workshop . Before and between teaching gigs he worked in arts admin, radio, and publishing, including editorial stints at Farrar, Straus & Giroux and Fence Magazine. From 2015 to 2017, in partnership with the University of Arizona Poetry Center, he was creator and host of the biweekly poetry-and-music program Speedway and Swan on KXCI Community Radio. He teaches creative writing and literature at The University of Idaho and in the Bennington Writing Seminars . He and his partner, the poet John Myers , make their home in Moscow, Idaho . What more to say ? What else is there to know ? With its roots in the Latin “exigere”, to examine, and in the Middle French “essaier”, to attempt, to put something to the proof, the essay form, from its inception, has been peculiarly alive to the interrogative relationship it has with the self that writes it. Montaigne , held to be the progenitor of the form with his Essays, published in 1580, asked the question “Que sais-je?” (“what do I know?”) in his essay “Apology for Raymond Sebond”. Proxies is award-winning American poet Brian Blanchfield’s first book of essays, and it returns the form to “Que sais-je”? The short introductory note outlines what might be seen as the book’s USP, “a total suppression of recourse to other authoritative sources” while composing it. The single-subject essays were written with the internet off and without consulting books and other works that either feature or are referenced in the pieces; his own memory was Blanchfield’s only guide. Accordingly, there is a 20-page “correction” at the end that aims to remedy the occasional blurriness and errors of referencing. And yet this trick, enabling Blanchfield to let the constraint lead him to “an area of personal uneasiness, a site of vulnerability”, is the least interesting aspect of what might well be a book like no other. A formal constraint – the 14 lines of the sonnet, the difficult rhyming scheme of the villanelle – is also of course a challenge, an invitation. The sheer variety of the seemingly unrelatable and unrelated subjects Blanchfield brings into conversation with each other in these essays is exhilarating. A sampler: Helen Keller, Martin Heidegger and Roman Jakobson rub shoulders in “On Propositionizing”, an essay on how language gives us the ability to propose relationships between things. Theocritus, Renaissance pastoral poetry, Rufus Wainwright and the title of a Robert Duncan poem, “Often I Am Permitted to Return to a Meadow”, mingle harmoniously in “On the Locus Amoenus”, the happy place that is so central to the pastoral. John Milton , Edward Dahlberg and Blanchfield’s own Primitive Baptist upbringing in North Carolina come together seamlessly in “On Confoundedness”. The democracy and spectrum of his allusions are startling. Yet it’s not the wealth of references a learned writer pours into a work that matters but its synthesis, and in this the figure standing behind the author is Roland Barthes , with his concept of “idiorrhythmy”, which Blanchfield glosses as “voluntary, nonfamilial togetherness”, the principle behind creating a dossier, which is “a repository of otherwise loose relevant material … on a subject”. What unites everything is the self, so that the essay can move to a looser and bigger genre – memoir or life-writing, as the subtitle, Twenty-Four Attempts Towards a Memoir, indicates. Although every piece here records some kind of reckoning Blanchfield has with himself, some are more memoir-ish than literary analytical. “On Withdrawal” and “On Tumbleweed” put together a picture of his life employed in part-time or limited-term teaching jobs. An account of foot disgust in Sophocles’ Philoctetes leads to the awful way his stepfather treats his mother and ends with two graphic paragraphs on her washing and dressing the open wound (“frightfully clean, like a throat”) on the sole of her husband’s right foot every evening after dinner. In “On Peripersonal Space”, Blanchfield tussles with his mother’s open distaste of his homosexuality. There is the exact moment he falls in love with his boyfriend, John, another poet, in “On Propositionizing”. One of the most beautiful essays in the book, “On Tumbleweed”, contains a tender portrait of John and his father, the last paragraph ending in a conjoining of love and writing. Part of the joy in reading Blanchfield is experiencing the way his alchemical mind and style fuse disparate things, always unexpectedly, into gold. The style is a thing of wonder: dense; learned, cleaving towards the academic, without ever being Casaubon-dry; lyrical (we never forget that he is a poet); often joyously gnarled but always surprising. Only in this book will you find the image box – the live videofeed – of a gay dating website called manroulette described, with absolute literary scholarly accuracy, as a “font of eidetic fantasy”. He can observe the world minutely, as when he writes how “owls have a concentricity about their feathery faces”. In a catalogue of school canteen food, he notes: “White crimini mushrooms ever in their bin at the salad bar.” Why is that “ever” so perfectly positioned, so funny? Like Montaigne, Blanchfield would probably say that it is only ever possible to tend towards knowledge, never reach it, hence the US subtitle, “Essays Near Knowing”, where “near” could be both indicative of proximity (but never identification) and also, if we take it as a verb, as a journey towards a destination that is always already elusive, unreachable even. And throughout our journey, often we are permitted to return to a meadow. So, in the end, what does he know? An enormous amount, it turns out. But a more interesting question he might have asked of his project could have been: “How do I express what I know?” The answer can be given in one word: inimitably. • Proxies: A Memoir in Twenty-Four Attempts by Brian Blanchfield is published by Picador. To order a copy for £8.49 (RRP £9.99) go to bookshop.theguardian.com or call 0330 333 6846. Free UK p&p over £10, online orders only. Phone orders min p&p of £1.99.